Hello Beauties! 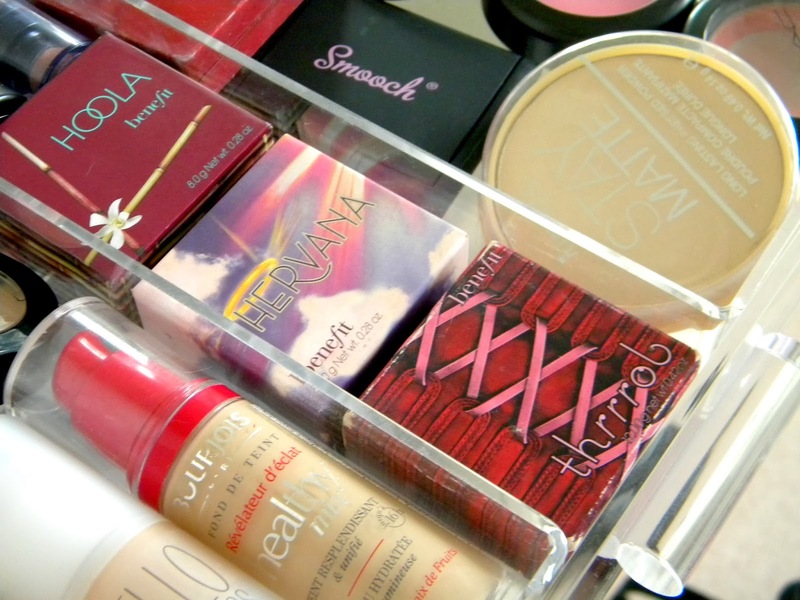 Today I have a bit of a special post for you all - my make up collection and storage! I'm mainly going to talk about the storage I use as this post would take me ages to go through all the make up I own, but if you see anything in any of the pictures which you would like to see photos of or would like to know more about, let me know in the comments below and I will get back to you! 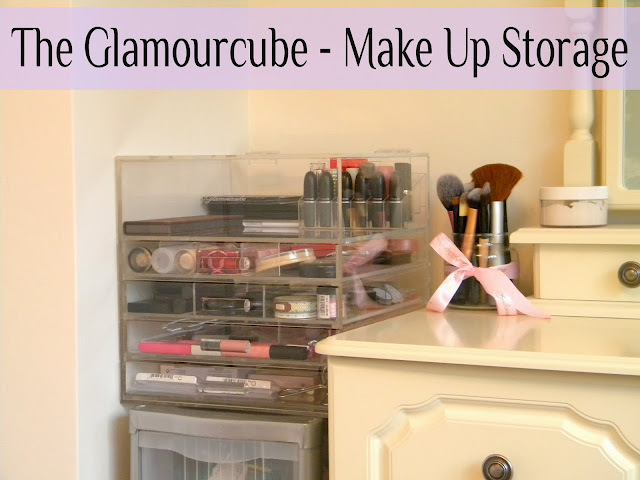 At the moment I store all of my make up in the Glamourcube which sits on top of a plastic draw unit which houses all of my skincare, nail polish and products which I've been sent to review that I haven't got around to testing yet. Both of these units fit nicely in next to my chest of drawers and mirror so it's perfect for getting ready in the morning. In the lift up compartment at the top I keep all my palettes such as my UD Naked and Ammo Palettes, MAC Pro Palette, Sleek Palettes and an MUA palette. 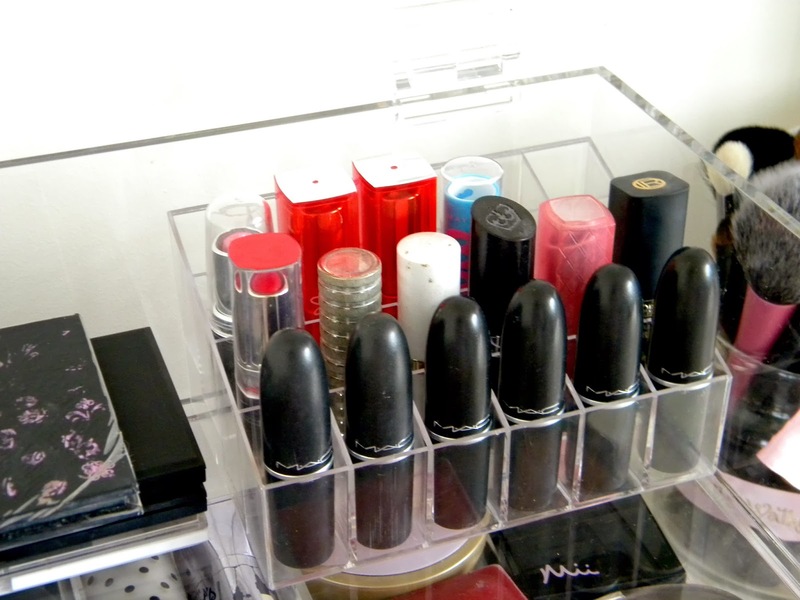 I also keep my lipsticks in the section as it is deep enough to fit in a lipstick storage stand and still close the lid. I bought the lipstick container from Amazon and it cost me around £2 so it's a really inexpensive way to store your lipsticks, while still looking neat and professional. The top compartment fits all of this with plenty of room for more so when my collection grows I will still have plenty of room to store any extra bits and bobs in this compartment. In the first drawer I keep all of my face products which I have sectioned off using the sliding dividers which some with the Glamourcube. I have moved mine so there is a thinner middle compartment which keeps my Benefit boxed blushes from moving around in the box, and also keeps my foundations in place. 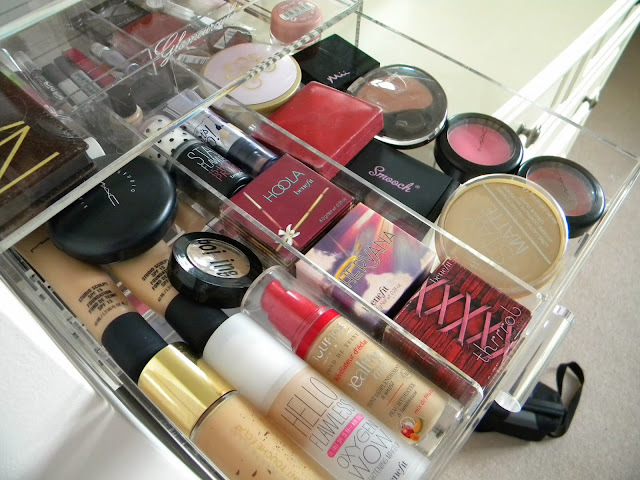 In the left section I keep all of my foundations, concealers and a MAC Studio Fix powder. In the thinner middle compartment I've stored my Benefit Boxed blushers, a Benefit Stay Flawless and a Benefit Watts Up as these fitted in nicely above the boxes. In the right compartment I've kept my blushers, bronzers and a couple of highlighter products as this was the largest section and as you can see, it can store quite a lot of compacts. The next drawer down houses all of my eye products which aren't in palettes. I have used the dividers which split the drawer into six smaller compartments as it meant I could store my eye products in categories and keep it all together. 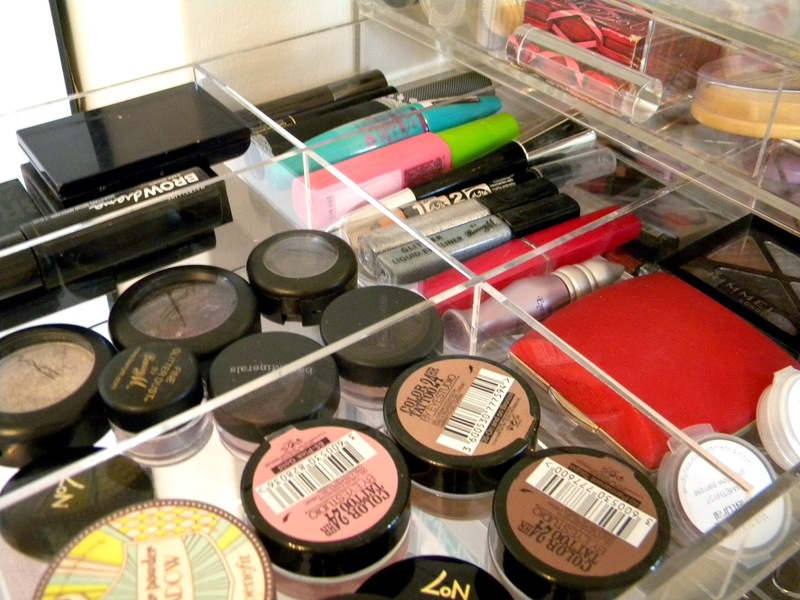 In one of the compartments I have mascaras and in the one underneath it I keep all of my brow products so I have them all together and they are easy to find in the morning. I also keep all my larger MAC eye shadows and one or two which I haven't got around to depotting yet. I also keep some bare minerals and other eye shadows in these two compartments and my Mabelline Colour Tattoo's. In the back I have a couple of eye shadow quads and in another compartment I keep my eyeliners and a small Urban Decay primer potion. 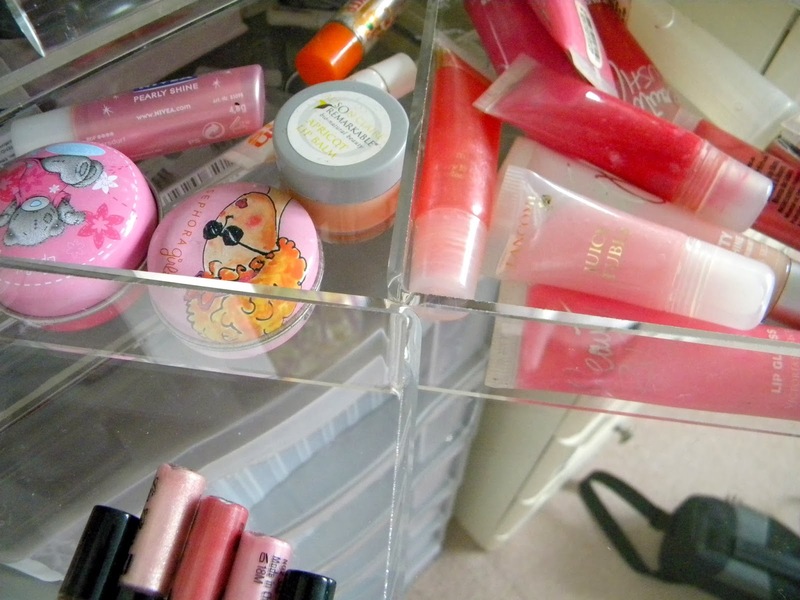 In the next drawer down I have used the dividers which split the drawer up into 4 sections, I don't have that many lip products which aren't stored in my lipstick container so this drawer is looking pretty empty. I've split my products into the types of containers they are stored in so squeezy tube lipglosses are in one section, etc. And in the last drawer I just have some false eyelashes and glue, and my eye lash curlers. 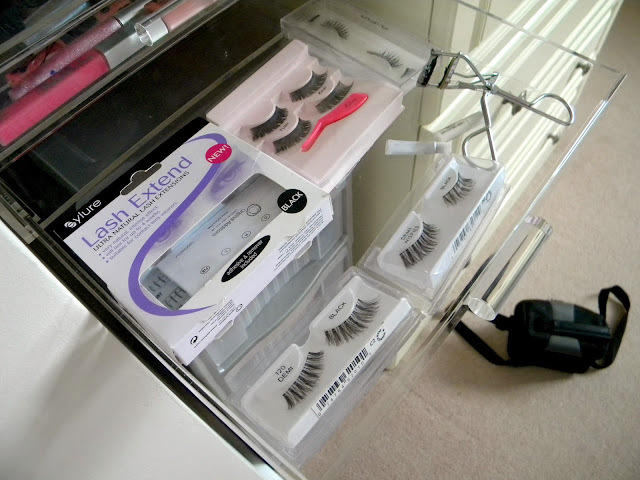 Again, this drawer is pretty empty as I usually lose my eyelashes when I take them off! This drawer doesn't have any dividers but you can easily move the dividers around so that they are in different drawers or split the 6 compartment divider up so that it only splits into 3 and use the other 3 in the bottom drawer but it really depends on what you want to store. Lastly, I thought I would show you how I store my make up brushes. I store them all in this old Yankee Candle jar and I've just tied this ribbon around it to make it look a bit more girly. I also have a larger one of these on the other side of my mirror which stored my cotton wool pads. 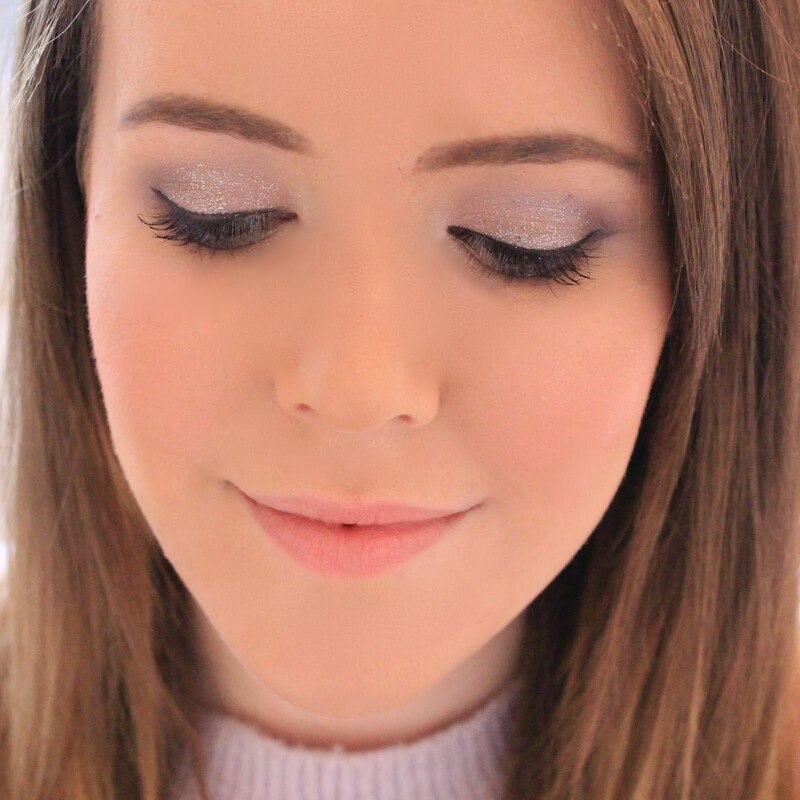 I hope you liked my make up collection and please do leave any questions in the comments below! 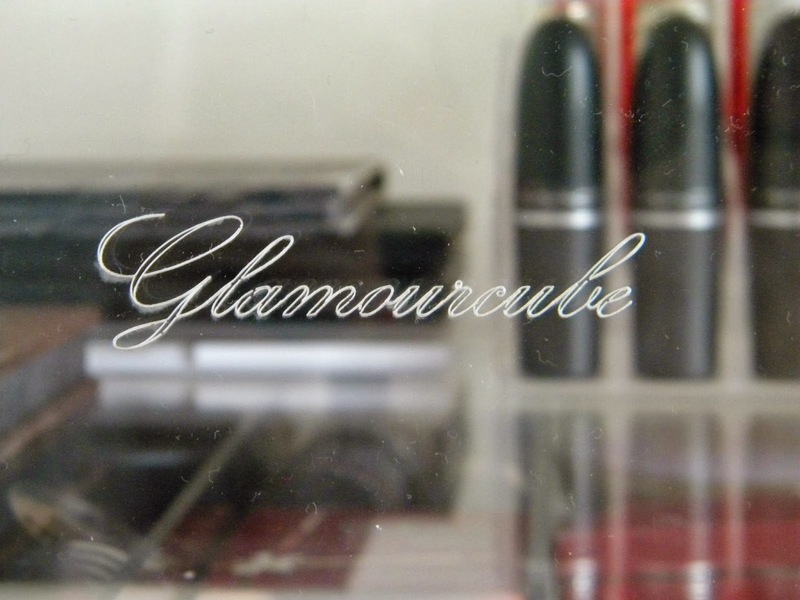 If you are interested in finding out more information about the Glamourcube or looking to purchase it, you can do so HERE. I love this, need something like this for my makeup. Where did you purchase this ? This is lovely! So organised!! It all looks really pretty. 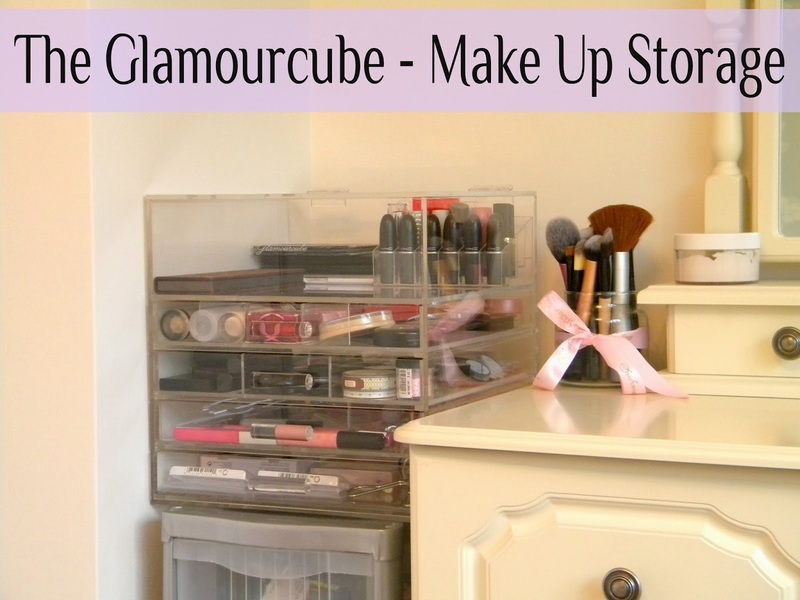 The glamourcube sounde like a beauty blogger's dream storage solution! 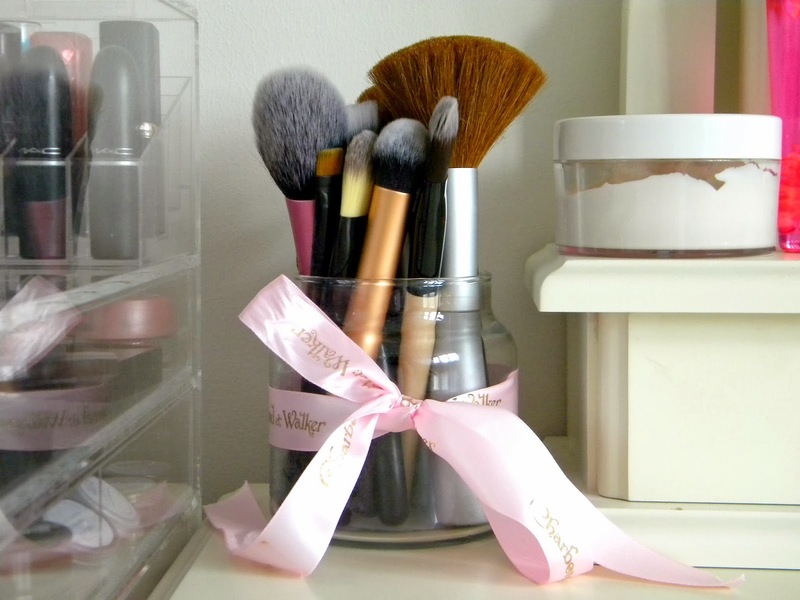 This is amazing.The neatest way to store makeup . Oh this is great, so organised! 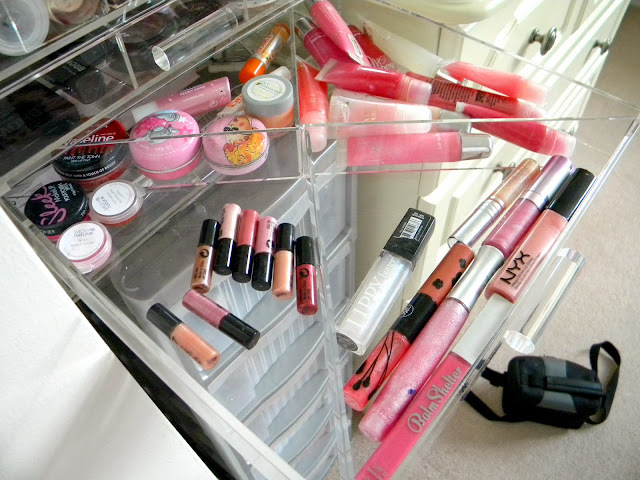 I need to get my stuff all neat and pretty like this! Lack of disclaimer in this post? There is no disclaimer on this post as this was a competition prize. The winners were drawn at random and I was not required to review it - you can read about this on my PR And Disclaimer page. 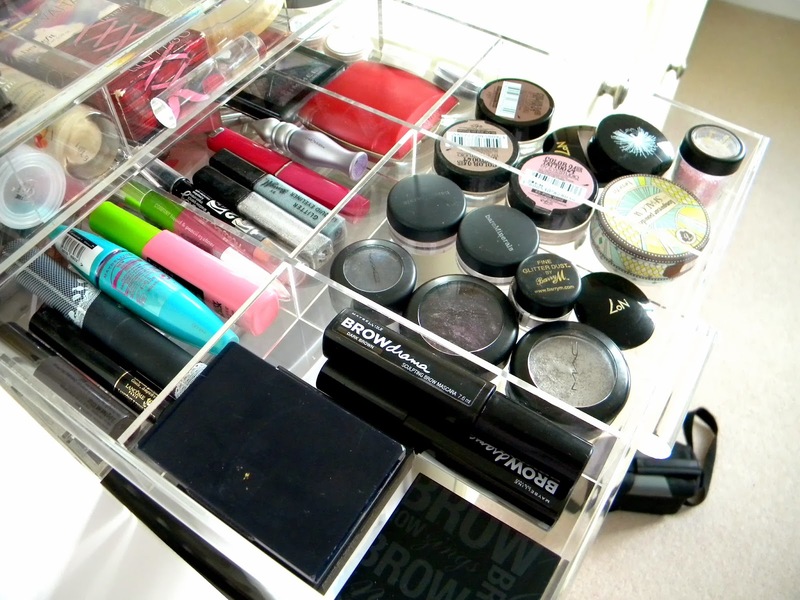 That's a makeup collection to envy for sure, and it is so organised! I am definitely going to invest in one.